Last year, for a project, the youngerchild and I collaborated on making a beeswax-based wood polish for one step in making a wooden box which would hold all of the other items in the project. Well, the rest of the beeswax/myrrh mixture has been sitting on the kitchen counter ever since, waiting to be made into something else. 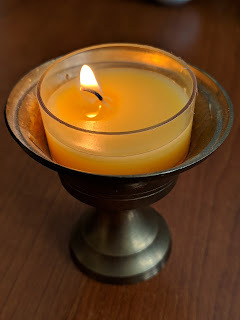 Basically, it was the same thing as lip balm (which is kind of weird, if you think about it) but it's also mostly beeswax and scent, so I thought I could make little candles instead. I remelted the mixture and poured it into tealight molds. Voilá. Candles. However, whatever else was in the mixture has definitely changed the melting point so they burn a little too fast. I think I should just use plain beeswax from now on. When I get more wax. I wonder how my bees are doing? In the farm share, we got a lot of beets. Fortunately, they last a long time in the fridge if stored properly. When I get golden beets, I make a plan to make this Golden Beet Orange Cake. Last Friday I had a friend visiting and finally made this cake. It did take several days, as I roasted the beets on Wednesday and made the cake on Thursday. On Friday, I rushed home from work and made the glaze. The previous time I made this cake I used lemons instead; I think I like the oranges better! Last weekend, I cleaned out the freezer and made a whole lot of stock. I had bones from various turkeys, chickens, and even a goose. This was, however, the first time I roasted the bones before making the stock and it really did improve the flavor, so that will definitely be something I do again. For each type of stock I: blanched the bones in boiling water for 20 minutes and the roasted them at 450˚F for 30 minutes. Then I boiled them with salt, pepper, bay, and onion skins. There wasn't a lot of fat when I did them this way, maybe because the fat cooks off with the roasting? Not sure. Regardless I set the stocks aside to cool in the fridge so I could skim off any fat that was there. The only one that really needed that was the goose stock. Since I had about a gallon of the goose stock, I used that plus turkey and chicken meat to make a "turducken" soup, I guess it would be "turgoosen" this time. This did not get canned; some is in the freezer and some is for eating now. I basically followed this recipe, including the farro and wild rice, but the meats and stocks were different, as I already mentioned. Today I brought out the rest of the turkey and chicken stocks, reheated them, and they're now in the pressure canner together. Ultimately, this made 4 pints of chicken stock and 8 pints of turkey stock. That ought to be enough for the year? Maybe?